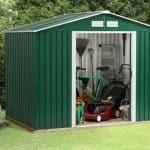 We found this a well built storage shed for the price, and in many ways its compact footprint is an advantage. Because of its size it complies with caravan park regulations, which makes it an ideal shed to use alongside your mobile or holiday home. It’s also a great value for money choice for people with small gardens or first time home buyers, allowing them to get the most out of their garden. 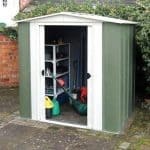 It would have been good to see this shed feature a pent, or even apex, roof to add a little extra space once inside, but even so most people will not feel too uncomfortable moving around to store or retrieve items. Made of hot dipped galvanised steel it’s more stable than it looks at first sight, and has excellent rain resistant qualities which are backed up by a 10 year guarantee against rust. The single door is in a cream colour that contrasts nicely with the green used elsewhere, and is fastened by a pad bolt. We would recommend adding a padlock, however, if items of value are to be kept inside. The dimensions of the door were wider and taller than those found on many similarly priced sheds, adding to the versatility of this garden building. 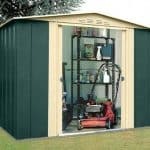 Metal storage sheds such as this are often located in exposed areas, and subject to a large amount of weathering over the years, so we like to see an apex or pent roof that will carry water away from the shed itself. In this case however, there is a flat roof. While we are confident that the high quality components used will help to stop rot developing even in these circumstances, it still means that there will be an onus on the shed owner to sweep away deposits of rain or snow on the roof. 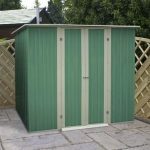 The roof itself is at a height of 1.78m above ground level, and other important dimensions that you’ll want to consider with this shed are its width of 1.83m and depth of 0.92m, both including the overhang. When choosing a suitable area for a base it will need to be at least 1.71 X 0.82m. We sometimes worry that thin metal cladding on highly affordable sheds such as this will create a flimsy feel, which can then become problematic in strong winds. We were pleased to see, however, that the hot dipped galvanisation used on the steel cladding made it feel strong and stable when installed. On top of this, two thick coats of metallic paint have been added which further help to protect the metal against extremes of temperature. There is no floor included as standard, as it is designed to be fixed directly onto a flat concrete surface, or possibly a patio. We would have liked to see a fixing kit included as standard, but the customer has two choices available to them: a steel foundation kit and a timber floor kit. As this shed has a flat roof it could potentially be more susceptible to rust, due to water sitting on the surface for prolonged periods. We were happy, therefore, to find that the manufacturer provides a 10 year warranty against rust, which is another indication of the quality of galvanised steel and paint used. There are no retreatment requirements for the customer, which is one of the advantages that metal sheds have over wooden ones. When reviewing this shed the door really stood out, and not only because its cream colour is in contrast to the green painted walls. We find that many doors on metal storage and utility sheds have very small openings, but this one was both wide and tall enough to enter through without having to stoop too much. It has a height of 1.73m, and a width of 0.65m, and features a pad bolt that can be used for fastening purposes. There are no windows in this shed, although because of its central position we found that the door, when open, provided good illumination throughout the shed. 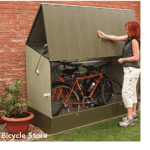 We would have liked to see a padlock included with this shed, or at least as an official optional extra, but at least the pad bolt is holed to allow the easy fixing of a lock purchased from an external source. It’s an all important purchase for a storage facility, particularly if left unattended for long periods at a caravan site. The lack of windows is a design feature which stops unwanted eyes from seeing what’s kept inside, which itself boosts privacy and security. One of the first choices that you will have to make is what kind of floor to use with this shed. If you already have a suitable, and level, concrete base then a set of high quality Hilti screws can be purchase to fasten your shed securely to it. Alternatively, a steel foundation kit is offered. We found the instructions for this kit easy to follow, and it included everything needed to create a solid, stable, and long lasting base. We were please to see that a timber flooring kit is offered as well, which is ideal for people who like the warmth of a traditional wooden floor. 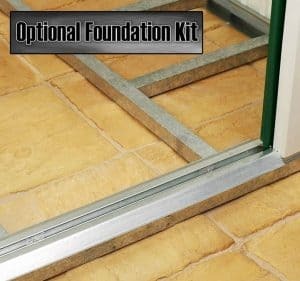 It’s a stand alone kit, meaning that you won’t need to buy the steel foundation kit as well. The painted finish on this shed is just one indication of the high quality components used. The two coats are tough and flake resistant, and look good as well. The flat roof does give us some cause for concern, but this is offset by the use of hot dipped galvanised steel and the provision of a 10 year guarantee. An apex would have added a little more valuable space, but this is a good choice for people wanting a convenient storage facility with a compact footprint. We found this an easy to shed to assemble, taking two of us around four hours after the initial use of the steel foundation kit. The use of a flat roof does make the overall construction easier than it might otherwise have been. 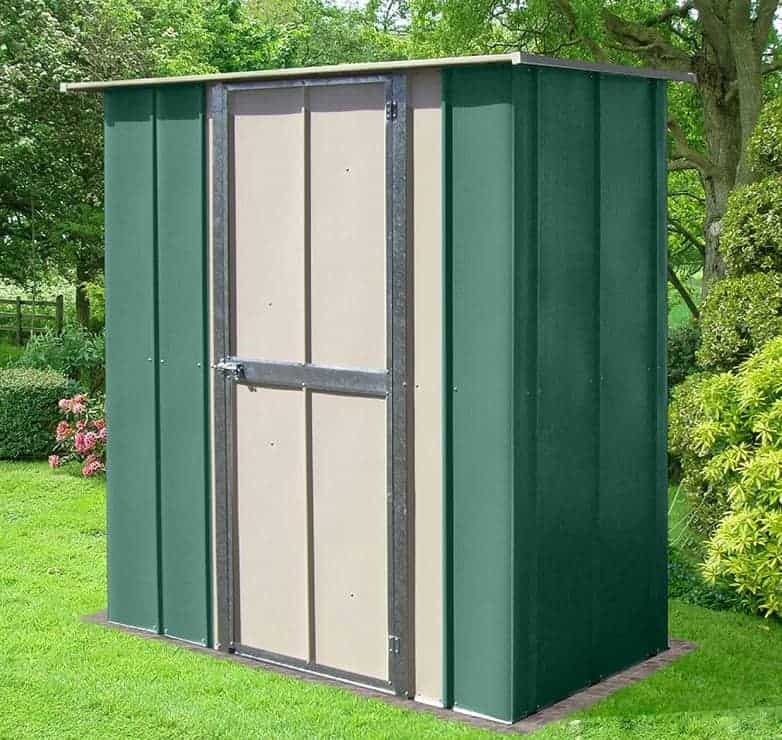 For a good looking metal shed with a 10 year guarantee against rust, this represents good value for money, even though extra purchases are needed for the base and a padlock. 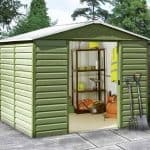 Final Thoughts: We liked the fact that this shed’s compact dimensions make it suitable for caravan parks, as these are becoming increasingly popular places to spend leisure time. Whilst the flat roof can hold rain water, it has the advantage of making self-installation of this shed quick and easy as well as keeping costs down, and the threat of rust is reduced because of the hot dipped galvanisation that the steel cladding has gone through. Thanks to the relatively tall door, it’s easy to move even larger tools and equipment in and out, although we would recommend that further security be added in the form of a padlock or alarm.